MemoryMiner v. 1.1 for Windows: The Best Story Keeps Getting Better! 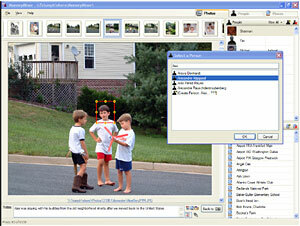 We’ve followed up our award-winning MemoryMiner for Macintosh product with a ground-breaking Windows version that brings digital storytelling to the Windows Vista, Windows XP and Windows 2000 platforms. MemoryMiner enables you to intuitively explore your digital media library, enhance it with annotation and linking, and then publish stories on the web. Document – MemoryMiner gives you traditional documentation tools –but that’s just the beginning. 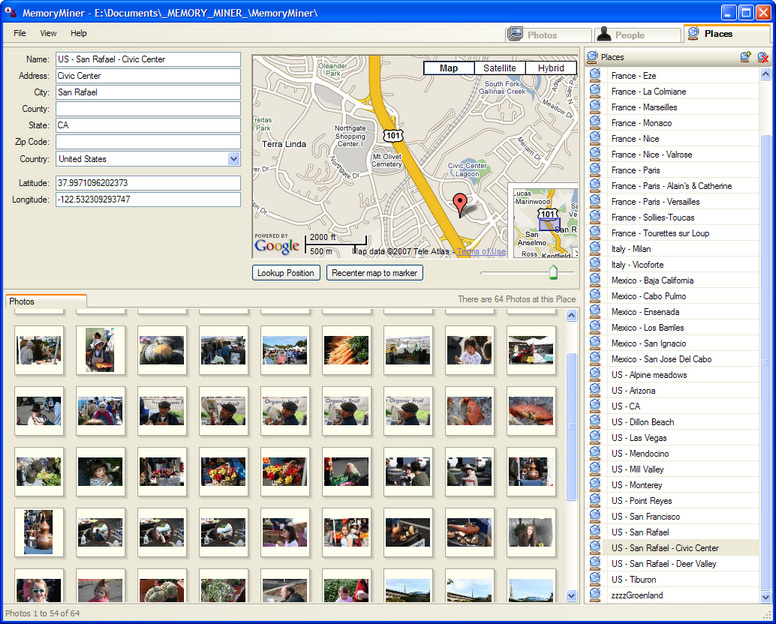 Add titles, annotation and attachments to your pictures. 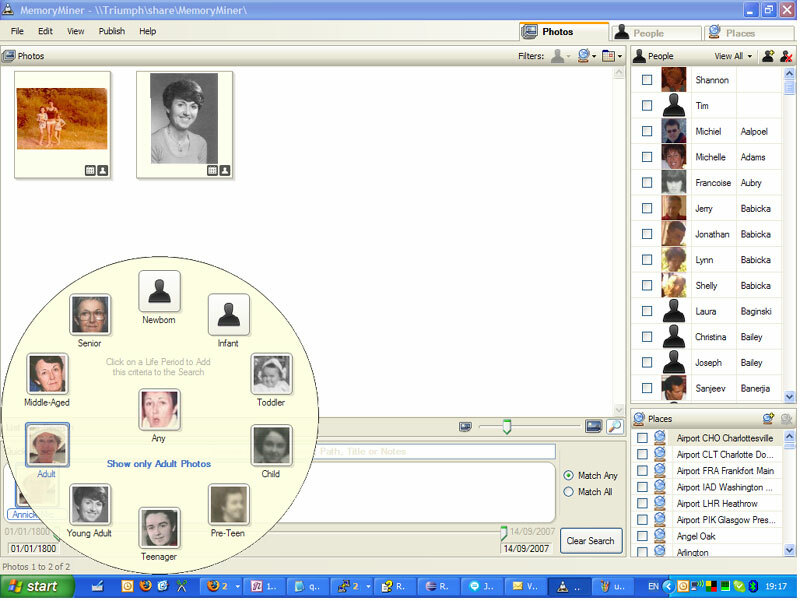 Identify the people in your pictures by linking them to a MemoryMiner Person. 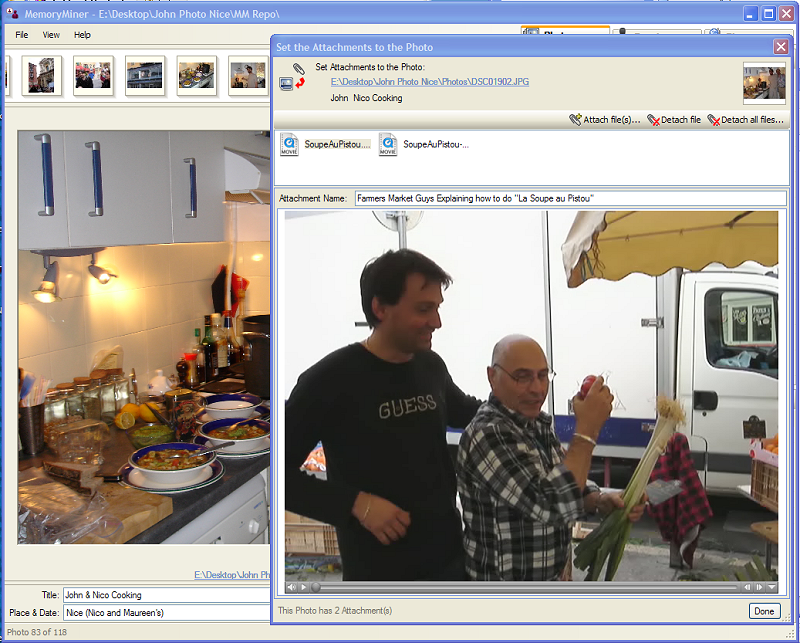 Link your pictures to a MemoryMiner Place. 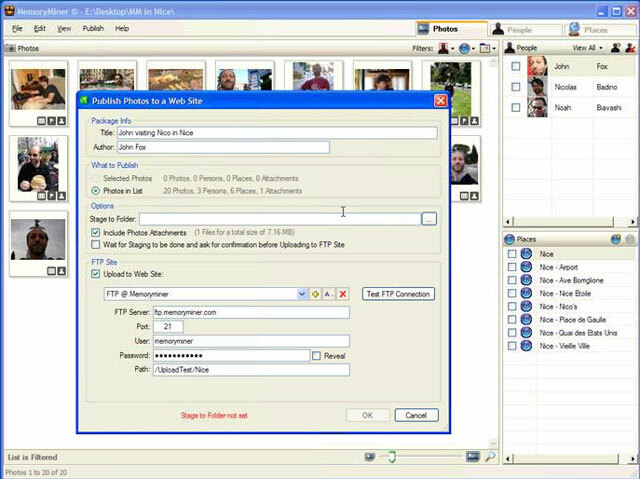 Assign a time to your pictures –even if you’re not sure of the exactly when it was taken. 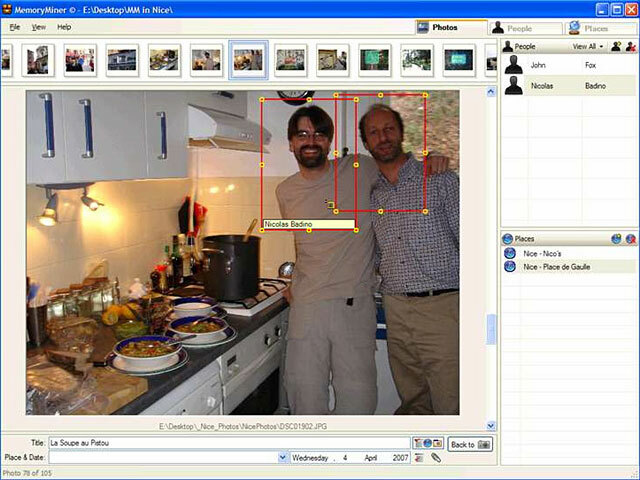 Explore – With MemoryMiner, your pictures take on a three-dimensional aspect that will change the way you think about them. 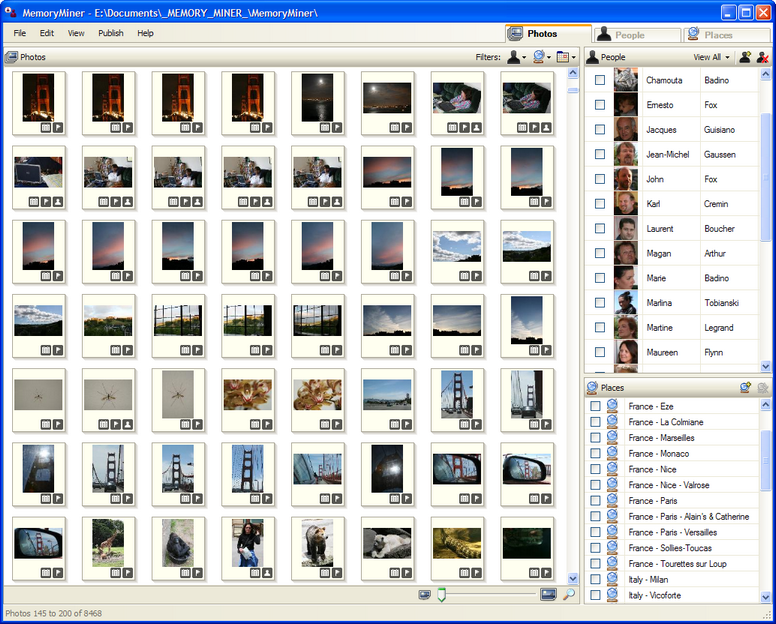 Sort your pictures by time, or name. 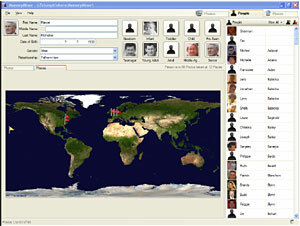 Filter your collection by People, Place, Time or Filename –or any combination of the four. 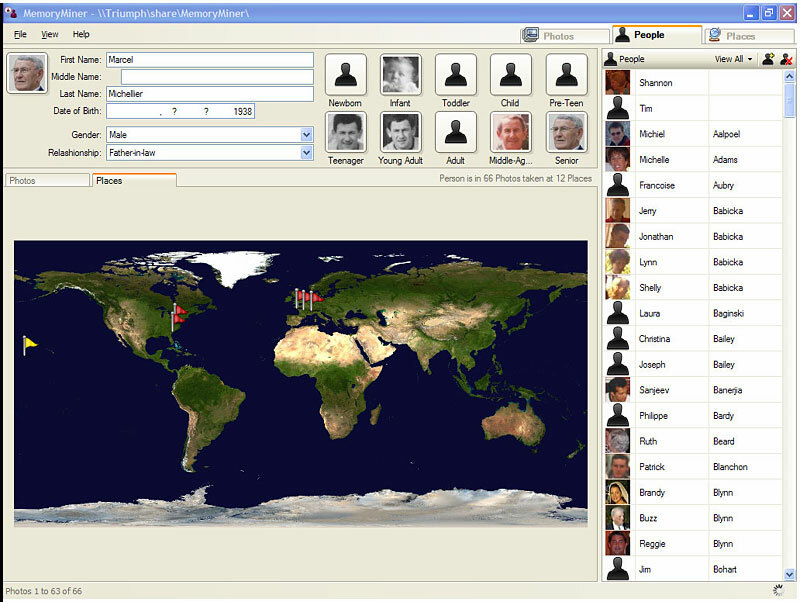 Visualize the story surrounding a person with a tableau of their pictures and an overview of where they have been projected onto a map. 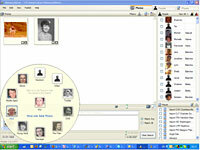 annotations, dates and titles of the pictures, complete with an interactive slideshow. 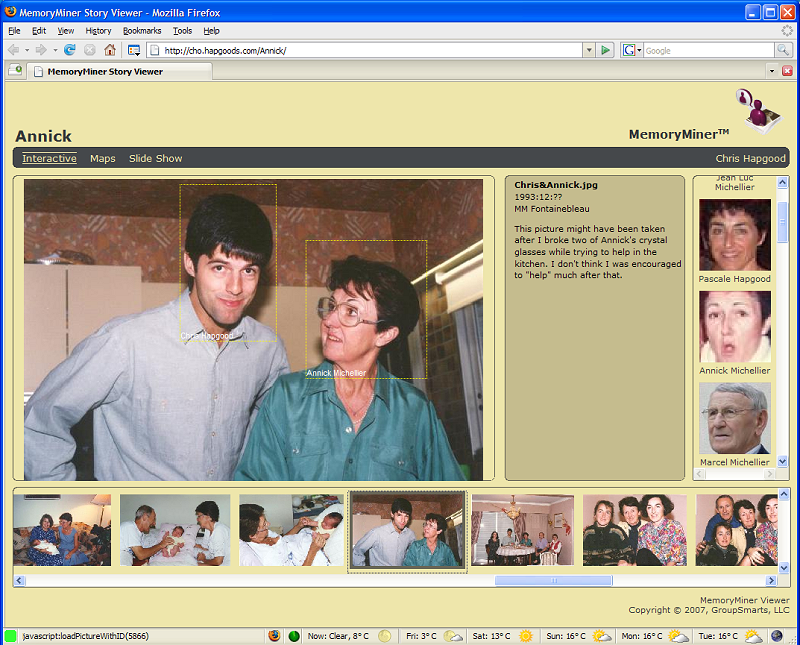 MemoryMiner turns that dusty box of pictures in the attic into a trove of personal history that reveals long-forgotten memories. And that amorphous stockpile of digital camera output accumulating on your hard drive will snap into focus, allowing you to separate the wheat from the chaff. MemoryMiner runs without restriction for 15 days. Give it a try: we think you'll be hooked. Note: If you're running Windows Vista you already have .Net 3.0 installed. Securely purchase a license code using the "Buy Now" link at the top of this page. You'll get the license code right away on the web page, with a copy sent to your email address.